What could your organisation do to benefit the local community with £5,000? For more details check out the website. The Herbert Protocol is a national scheme adopted by Cumbria Constabulary and other police services across the country. Councillors have received complaints about vehicles parking on pavements which has forced residents using mobility devices and pushchairs to walk in the road. Drivers are requested to park responsibly leaving sufficient space for pedestrians to pass safely. If the vehicle is causing an obstruction on a pavement this could result in a fixed penalty notice being issued by Police. Due to concerns about the risks of driver distraction and pedestrian safety, residents are requested not to attach posters/boards to the lamp post across the road from the Pharmacy and Fat Flour. The Parish Council plans to install a larger Noticeboard in the Square which will have space for Parish Council and public notices. The Parish Council External Audit has now been concluded. The External Auditor Report and Certificate 2017/18 and the Notice of Conclusion of Audit are now available. All the Financial Reports on are available on the Documents section of the website. 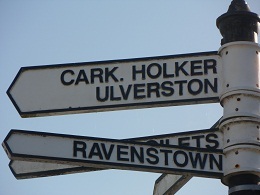 Lower Holker Parish Council has prepared a Community Emergency Plan. This is currently being updated, however the current plan is available on this link: Community Emergency Plan. This Branch closed on 3rd October 2017. A mobile banking service will then be available in Grange on Thursdays from 12 noon to 1 pm in Main Street Car Park, Grange. Post Offices can also be used for most transactions. Residents and businesses can now receive superfast broadband, but it has to be ordered as an existing broadband service will not become superfast automatically. For more information and advice see Connecting Cumbria. LEADER - capital funding for rural projects. Defibrillators are at Cockles on Flookburgh Square LA11 7JX and at Flookburgh Primary School, Winder Lane LA11 7LE , funded by the Parish Council and donations. Thanks to Cockles and the School for hosting these units. They are accessible 24 hours a day/7 days a week. To use phone 999 to obtain the access code from the Ambulance Service. There is another defibrillator in the Porch of Lower Holker Village Hall, Cark-in-Cartmel, LA11 7NU (no code needed).